Bionomic Industries, Inc., a leading manufacturer of clean air, product and heat recovery systems, has announced availability of their new ECharge Electrostatic Collector for high removal efficiency of smoke-type micron and submicron particles, droplets, and aerosols along with odor issues caused by these particles. Designed to easily meet PM 2.5 environmental regulations, the ECharge is extremely energy efficient and operates at a power saving 100 watts or less of electricity per 1000 cfm of gas flow at a low 120/220 volts. Modular design makes installation and maintenance easy. Multiple charging and collection cell modules can be stacked in stages for collection efficiencies of over 99.9% in a compact footprint, and pressure drop is a stingy 0.5 in., w.c. or less per stage. In many cases, the highly efficient ECharge allows the cleaned air to be recirculated back into the building - conserving heat energy and reducing utility costs. 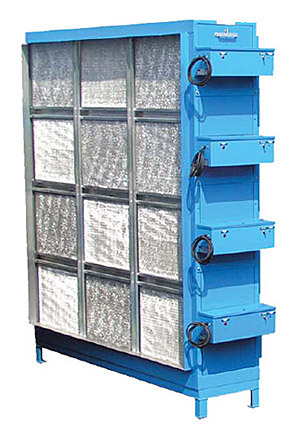 As an added benefit, the collector can be used to collect valuable dusts or liquids, resulting in additional cost savings. For services requiring removal of solids or liquids that adhere to collector plate surfaces, an automatic wash down spray assembly permits in place cleaning of the collected material making it extremely versatile for use in a wide range of applications. Units are also equipped with long life solid state power supplies for reliable operation. Standard units are available in carbon steel with aluminum plates and all 304 or 316 stainless steel, with custom material options available to meet more corrosive requirements. All units meet MACT and BACT standards for particulate emission control and help comply with OSHA standards for indoor air quality.